This processed image from Cassini's Aug. 22, 2005, flyby of Titan reveals mid-latitudes on the moon's Saturn-facing side. This region has been imaged previously by Cassini, although the recent approach has improved the moderate-resolution coverage of the area. Provisional names recently have been applied to a number of features on Titan. Features within the region seen here -- long known informally as the H -- now have names like Tsegihi, Aztlan and Quivira. The bright 215-kilometer-wide (134-mile) feature provisionally named "Bazaruto Facula" is clearly visible right of center, with its dark, unnamed 80-kilometer-wide (50-mile) crater at its center. 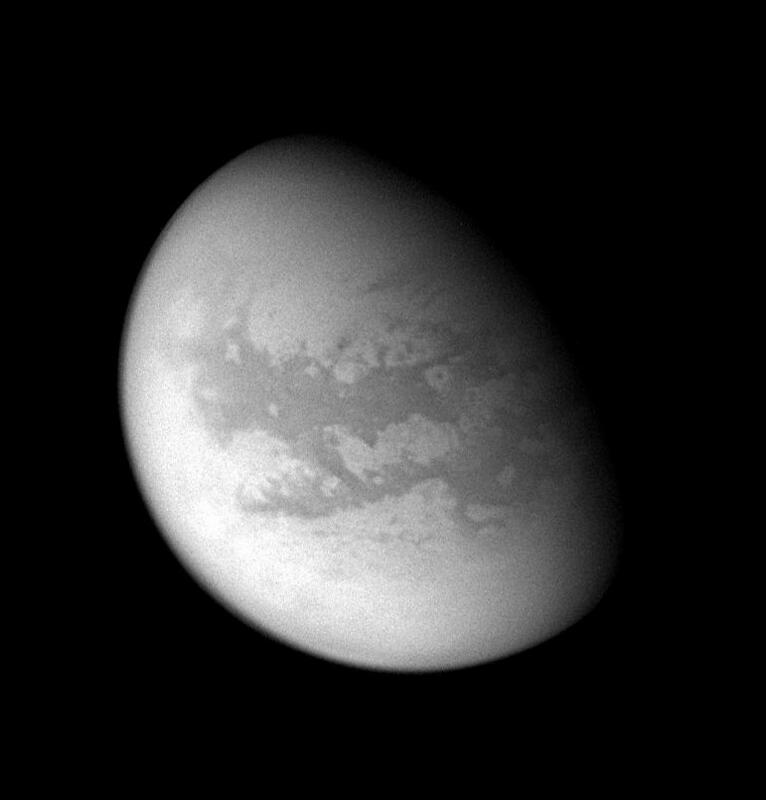 This view was acquired with the wide-angle camera at a distance of approximately 159,000 kilometers (99,000 miles) from Titan using a spectral filter centered on infrared wavelengths at 939 nanometers. The image scale is 9 kilometers (6 miles) per pixel. Previous observations indicate that, due to Titan's thick, hazy atmosphere, the sizes of surface features that can be resolved are a few times larger than the actual pixel scale. For other views of this terrain on Titan, see PIA06220 , PIA06222 and PIA06227 .